Traction Cleats and Anti Slip Soles. 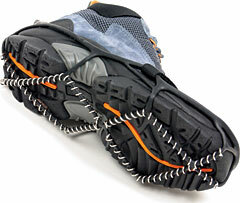 You will find Stabilicers, Ice walker Cleats, Get-A-Grip Ice Joggers, Yaktrax spikeless and strapless overshoes. Also budget priced Snowshoes. All shoe traction items are sold in Pairs.